Irresistible African rumba by the band Africa Negra, who come from the islands São Tomé and Príncipe and have been renowned in Portuguese-speaking countries for decades. 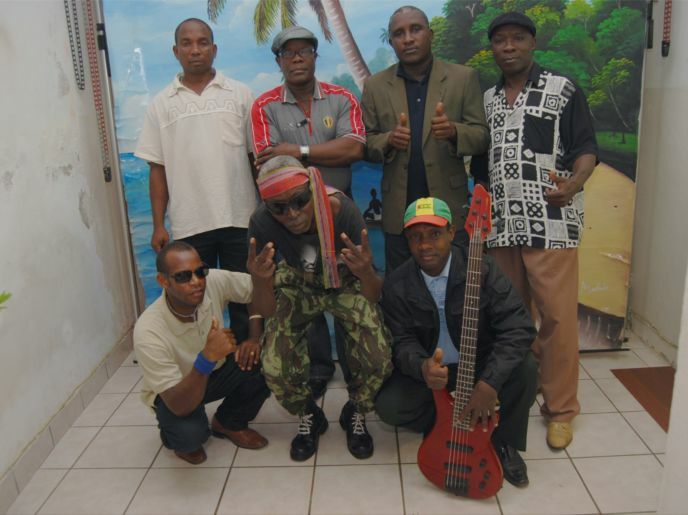 For the past 40 years, Africa Negra have been indisputably the most important and genuine ambassadors of the music of São Tomé and Príncipe, the island state in the Gulf of Guinea off the western equatorial coast of Central Africa. Their first LPs on the Portuguese label Iefe Discos are now very sought after on the contemporary global vinyl collectors market. In the current line-up the band revisits the early sound, high energy dance music with vintage instruments: electric guitars and effects, bass, drums and percussion. Popular dance rhythms and genres such as rumba, soukous and highlife are mixed with humorous Portuguese lyrics and social criticism. A festive highlight of the Amsterdam Roots Festival! Afterwards, in the cafe: DJ Alex Figueira (Vintage Voudou). Amsterdam Roots Festival presents artistic talent emerging from the exciting middle ground between tradition and innovation. It is especially in this overlapping area that cross-overs between cultures and styles spark to life. Click here for all Amsterdam Roots Festival concerts planned in the BIMHUIS, and click on the logo below for the full program of the festival. There is a special discount of € 8,50 for participants of Stadspas. Discount is valid when purchasing a ticket at the BIMHUIS boxoffice on the night of the concert, upon presentation of the Stadspas.